Singapore’s most trusted Roofing contractors and specialists! A regularly maintenance and care is required to assure durability of the structure. We hold pride to be premier roofing specialists in Singapore, offering total quality solutions to all kinds of roofing. It’s not just our experts attend the site, but they will keep on guiding you and provide tips to maintain the health and durability of roofs. Don’t delay if the roofs are cracked or seamed. Our Roof leakage specialists in Singapore are best in the town, rich with years of experience and implement an accurate methodology to overcome the leaks and seams! Either it’s commercial, residential or industrial roofing, our state of the art Roofing contractors in Singapore follow an action plan to deliver a master quality roofing work. It’s all starts when we visit the place, perform a detailed analysis about the site and then come up with the right planning, accurate cost estimation and all tools to assure 100% success rate. We have recently launched Roofing gutter installation service in Singapore in order to alter the dimension of company and make it a full stack roofing company in Singapore. So experience the most expert roofing services across the state and you will find our solution & services one step ahead. 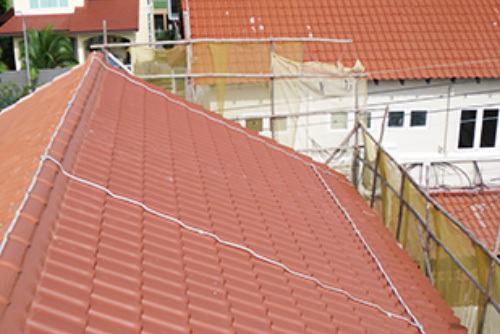 The company is now ruling the industry and promising a smooth and perfectly fitted clay tiles roofing installation in Singapore, winning the heart of clients and establishing a strong relationship. It’s not just roofing and its types, but at Build Best Roofing, it’s all about quality and standard.